Endocan, also known as endothelial cell-specific molecule1 (ESM1), is a secreted cysteine-rich dermatan sulfate (DS) proteoglycan primarily expressed by endothelial cells within the vascular capillary network in kidney and in the alveolar walls of the lung. Endocan expression has also been detected in different epithelia and in adipocytes. The expression of endocan is up-regulated by TNFα, IL1β or lipopolysaccharide and down-regulated by IFNγ. The human Endocan gene encodes a 184 amino acid (aa) residues precursor protein with a 19 aa hydrophobic signal peptide and a 165 aa mature region with 18 Cysteine residues. The DS chain is covalently attached to serine 137. Endocan has been shown to bind CD11a/CD18 integrin (also known as lymphocyte function-associated antigen1, LFA1) on human lymphocytes, monocytes and Jurkat cells, inhibiting its binding to ICAM1 and reducing LFA1mediated leukocyte activation. Endocan binds via its DS chain to hepatocyte growth factor (HGF) to enhance HGF mitogenic activity. Genetically engineered cells overexpressing Endocan has been shown to induce tumor formation, suggesting that Endocan may be involved in the pathophysiology of tumor growth in vivo. 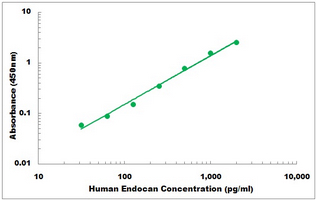 Circulating Endocan can be detected in the serum from healthy subjects. In patients with lung cancer or acute and severe sepsis, elevated Endocan concentrations have been reported. Scherpereel A., et al. (2003) Cancer Res. 63:6084.Bechard D., et al. (2000) J Vasc Res. 37:417. Western Blot analysis of ESM1 expression in transfected 293T cell line by ESM1 monoclonal antibody (M02), clone 6D4.Lane 1: ESM1 transfected lysate(20.1 KDa).Lane 2: Non-transfected lysate. 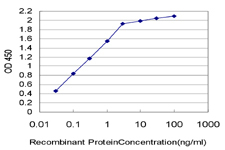 Detection limit for recombinant GST tagged ESM1 is approximately 0.03ng/ml as a capture antibody. Western Blot analysis of ESM1 expression in transfected 293T cell line (H00011082-T01) by ESM1 MaxPab polyclonal antibody.Lane 1: ESM1 transfected lysate(20.24 KDa).Lane 2: Non-transfected lysate. 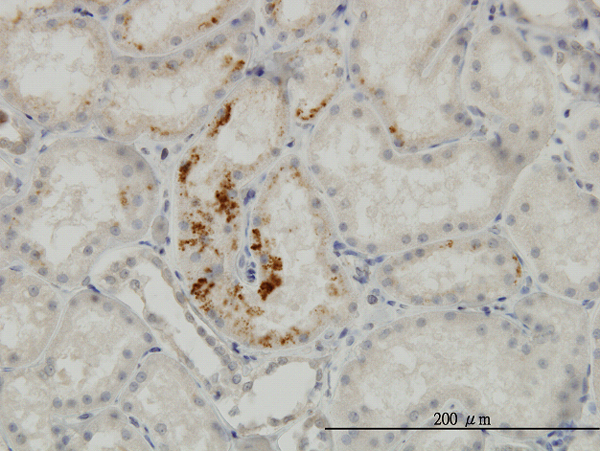 ESM1 MaxPab rabbit polyclonal antibody. 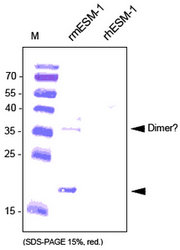 Western Blot analysis of ESM1 expression in human kidney. Western Blot analysis of ESM1 expression in transfected 293T cell line (H00011082-T02) by ESM1 MaxPab polyclonal antibody.Lane 1: ESM1 transfected lysate(20.10 KDa).Lane 2: Non-transfected lysate. 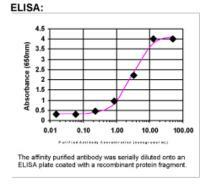 Immunoprecipitation of ESM1 transfected lysate using anti-ESM1 MaxPab rabbit polyclonal antibody and Protein A Magnetic Bead (U0007), and immunoblotted with ESM1 MaxPab mouse polyclonal antibody (B01) (H00011082-B01). Immunofluorescence staining of cryosections of unfixed human foreskin with anti-human Endocan/EMS1 Cat.-No. AP60002PU-N (dilution 1/100) and counter staining of nuclei with DAPI.&lt;br /&gt;Note specific green Endocan/ESM1 signals in epidermis, connective tissue cells and vessels. The experiment was performed by the research group of Prof. Dr. J. Wilting and Dr. K. Buttler, University Medicine Göttingen, Germany. Western analysis of anti-human Endocan/ESM1 Cat.-No. AP60002PU-N. Samples were loaded in 15% SDS-polyacrylamide gel under reducing conditions. 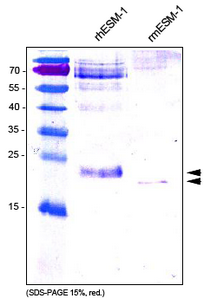 Western analysis using anti-mouse Endocan/ESM1 antibody Cat.-No. AP60003PU-N. Samples were loaded in 15% SDS-polyacrylamide gel under reducing conditions. SDS-PAGE analysis of recombinant human Endocan / ESM1 derived from insect cells Cat.-No. AR60002PU-N. Sample was loaded in 15% SDS-polyacrylamide gel under non-reducing conditions and stained with Coomassie blue. 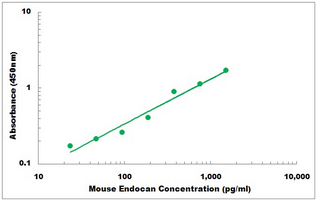 SDS-PAGE analysis of recombinant mouse Endocan / ESM1 derived from insect cells Cat.-No. AR60003PU-N. Sample was loaded in 15% SDS-polyacrylamide gel under reducing conditions and stained with Silver stain.